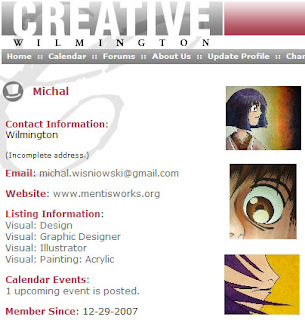 As a part of my ongoing efforts to promote my art, I am now on Creative Wilmington. Though not a new year's resolution per se, I did make a decision to push the artwork this year a bit harder. Having a Creative Wilmington account and making use of their services should help in this endeavor. In addition, I am getting ready for a show mid February, which is quite soon. I shall be posting the details on that very soon, and it's actually already up on Creative Wilmington's calendar as well as the WHQR Cultural Calendar. So stay tuned for that post here as well. In may we'll be schlepping our art stuffs to Animazement, as we finally got our Artist Alley table reserved. I'm pretty excited about that, but it does mean a good bit of additional work needs to be done. Prints need to be made, and so on and so forth. Not to mention we've got to get some costumes ready for this year! Should be a lot of fun though.